Next Thursday, March 15, Lyme-Old Lyme High School (LOLHS) welcomes prospective students who do not currently attend a Lyme-Old Lyme School and/or their parents to visit the high school during Spring Open House. Lyme-Old Lyme Schools were also named #18 in Niche.com’s ranking of 2018 Best School District in Connecticut, which gave them the top spot in New London County, and in Niche.com’s ranking of 2018 High Schools with Best Teachers in Connecticut, Lyme-Old Lyme Schools came in 10th. 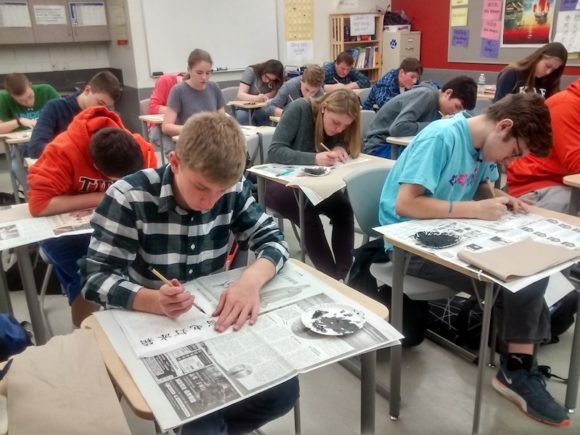 In 2016, LOLHS took 6th place statewide in terms of SAT results, with average scores significantly above the state average in all disciplines, while in April 2015, Lyme-Old Lyme High School was awarded the 185th spot nationally and the 5th place statewide in Newsweek‘s annual list of America’s Top High Schools. 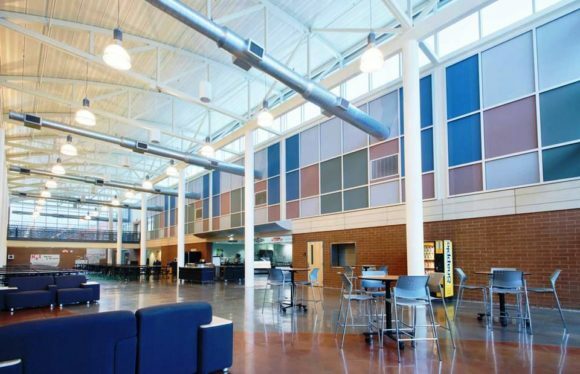 Facilities at the high school are exceptional with state-of-the-art technology implemented throughout the building thanks to a $49 million renovation project completed in 2014. The math, science, language, and technology and engineering areas, along with the art, music, drama and athletic facilities are now of a quality and sophistication that resembles a college environment, rather than a high school. View from inside the Commons atrium at Lyme-Old Lyme High School. Current enrollment at LOLHS is 475 students from Grades 9 through 12 and the average class size is between 15 and 20. The school offers a full spectrum of core subjects taught in-house, including 17 Advanced Placement subjects, and also an extensive range of classes taken online. Students also have the option to pursue the acclaimed Techno-Ticks robotics program along with more than 35 other extra-curricular clubs including High School Bowl, Mock Trial, and Key Club. Lyme-Old Lyme High School enjoys widely acclaimed music, drama and art programs, which have been recognized with numerous awards both at the state level and nationally. The school’s athletic program has similarly received innumerable honors over the years and is proud to have several past, present and future Olympians among its alumni. The colleges attended by LOLHS graduates include a wide range of Ivy League and top-tier schools each year. Complementing the academic success of the students, the high school faculty is renowned for their commitment and dedication to the students with most having obtained a sixth year teaching qualification. If you would like to attend this informative event, please call Glynis Houde at 860-434-2255 to schedule your appointment. For further information, contact Tracy Lenz, Director of Guidance, at 860-434-2255 or lenzt@region18.org or James Wygonik, Principal, at 860-434-1651 or wygonikj@region18.org.